We maintain a small collection of honey processing equipment including a motorized 9 frame extractor and hot uncapper. While we are not a full commercial outfit (someday! ), we do have some excess capacity to extract for neighbours and local beeks. If you are looking for someone to extract your small collection of hives, we would be happy to extract your honey for you on our farm and save your kitchen from a sticky mess. Schedule a drop off your honey supers, we will extract them after-hours during the week, and notify you when your supers and honey are ready for pickup. We require a minimum of two 10-frame honey supers per extraction order. 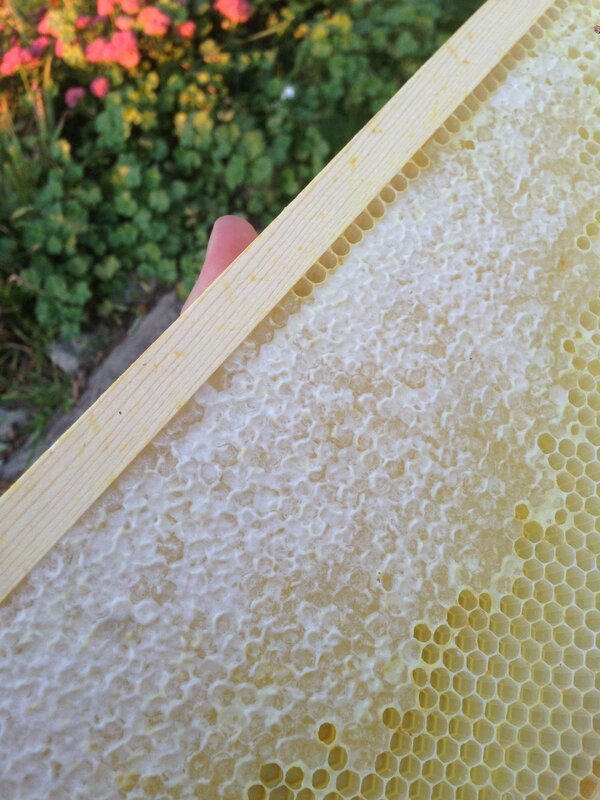 Your supers should contain capped honey, pollen is ok, but no brood should be present. For your biosecurity and ours your equipment should be relatively clean, dry, and free from live bees. Supply your own food grade buckets for us to put the honey in or borrow ours for a small deposit ($10.00 ea) refunded when you bring them back. Note: For practicality, we will keep your wax cappings. Extraction works out to be ~75-99 cents/pound depending on your yield. A 2 super extraction would cost $60.00 + HST and should yield you somewhere between 55-78lbs. Payment is due on pickup of your honey and is payable by cash, cheque, or by Visa/MC using our Square terminal. Our default extraction process involves honey going directly from the extractor to the pail, your honey will include bits of wax and pollen which will settle to the bottom of your pails. Some prefer it this way, some do not. If you would like, we can filter your honey using traditional pail sieves. Filtering is by gravity and slows the process down quite a bit so we have to charge a little extra to cover the effort. No filtering (included) - direct from the extractor to your pail. Light filtering (add $5/pail) - filters out wax chunks and foreign matter. Light + Fine filtering ($10/pail) - We first coarse filter, then pass through an ultra fine filter. This pulls out most visible pollen/wax. Contact us by e-mail, phone, or fill out the form below and we will reach out to schedule a drop off.